Beat cream cheese and sugar in large bowl with mixer until blended. Add eggs, 1 at a time, beating on low speed after each just until blended. Stir in extract; pour over crust. Microwave chocolate and cream in microwaveable bowl on MEDIUM 1 to 2 min. or until chocolate is almost melted; stir. Microwave 30 sec. to 1 min. or until chocolate is completely melted and mixture is well blended, stirring every 30 sec. 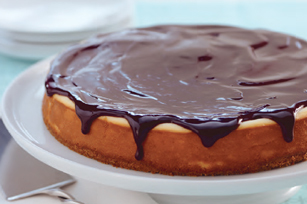 Pour over cheesecake; let stand 5 to 10 min. or until glaze is firm. For stronger mint flavour, increase the mint extract to 2 tsp.